Dogs of Gettysburg is a unique combination of gifts for pets and their people. Go in and browse the many items in a Civil War inspired shop. We are sure you will find something to keep you and your pet happy. Our featured items include pet clothing, collars, leashes , beds and dog treats. Feel free to place an order for a custom Civil War Uniform and Kepi – Union or Confederate. In addition enjoy the many hand crafted items from local craftsman and the surrounding area. Pets are welcome ! They are located at 777 Baltimore Street suite 102 Gettysburg,Pa. 17325 across from the tour center. They are closed on Mondays and open from 10 am – 6 pm Tuesday, Wednesday, Thursday and 10 am- 7 pm Friday & Saturday open Sundays from 12 – 5 pm. 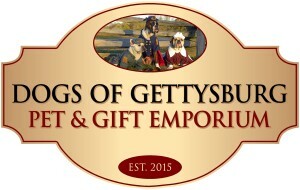 Posted in Blog, Feature Business, Things To Do and See and tagged Dogs of Gettysburg, gift shop, pet shop, pet supplies on April 24, 2015 by Gettysburg Battlefield Tours.